We know you’re busy, so we make prescription orders and refills easy. Order online via our website or give us a call, and we’ll have your pet’s meds ready in no time. At The Pet Hospitals, we want our patients to get the correct medication at the proper dosage. 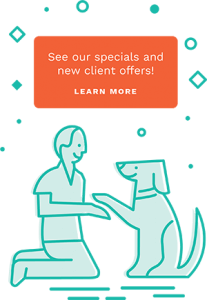 Because of that, we price match competitively with the major online pet pharmacies. Online medications can be gray market products, so we will always price match to keep your pet safe. When it comes to your pet’s health and safety, please don’t guess with medication. Click on Client Login at the top of the website and login. From there, you can view your pet’s medical records and order prescription refills. Should you have any questions, don’t hesitate to call us or chat using the Chat Now feature on our website.